What is the Chrome Music Lab? 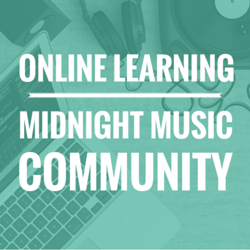 How can I use CML with my students? 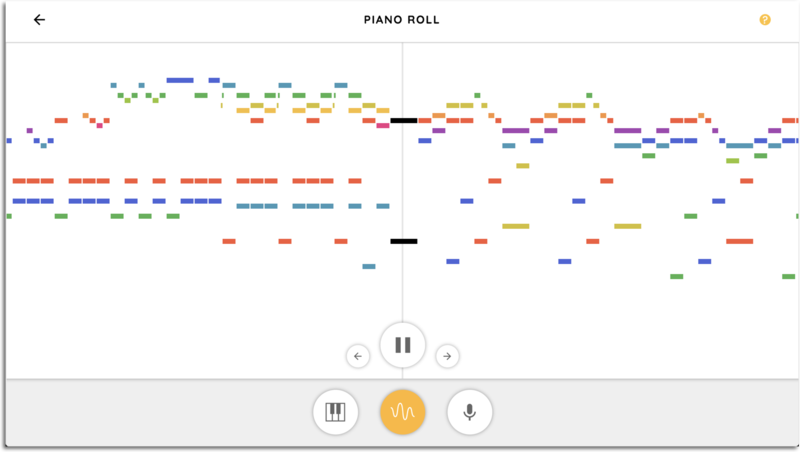 How are other teachers using the Chrome Music Lab? 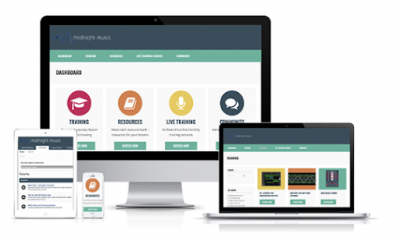 There are a collection of tweets showing how other teachers are using the CML here. 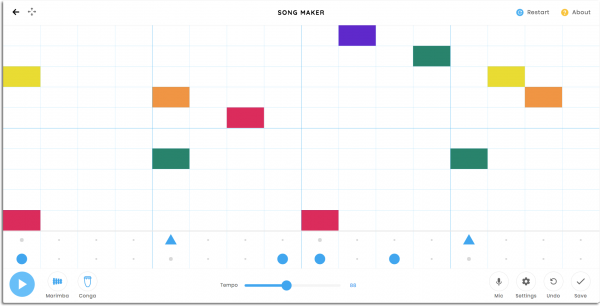 Create a song by clicking notes into the grid. The top section of the grid can be used for high notes, and the lower section of the grid for low notes. There are two rows of dots at the bottom for creating a rhythmic pattern. 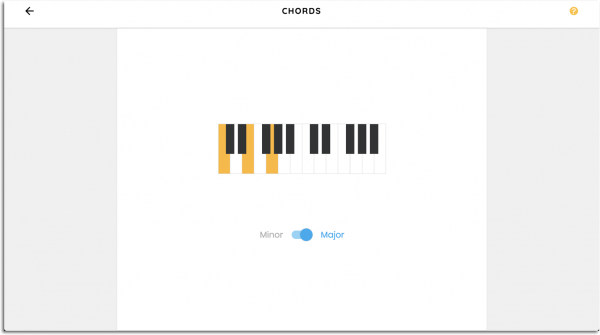 As a class, compose a bassline ostinato using the lower section of notes and then play it on classroom instruments (or sing it). 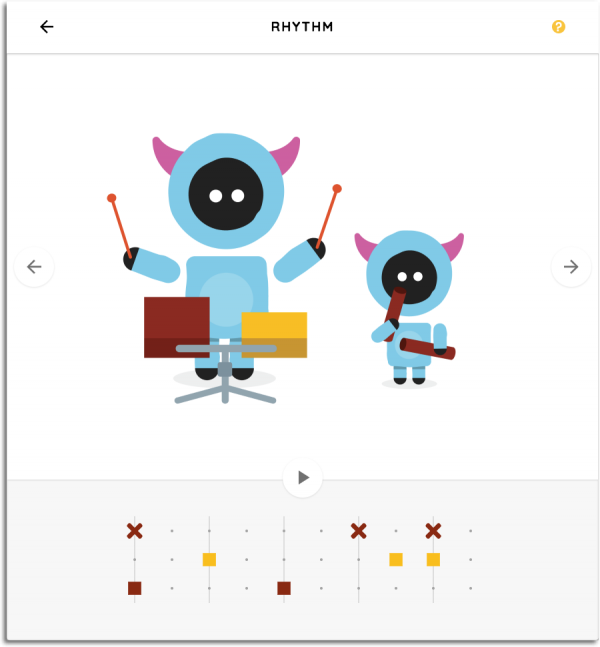 Click in the grid to see two animated characters play rhythms meters of 3, 4, 5, and 6. 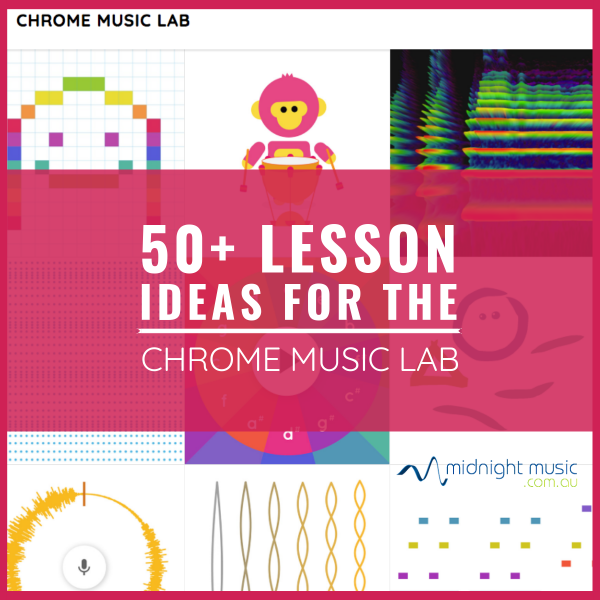 Download a free lesson plan – Explore Rhythm and Meter with the Chrome Music Lab. 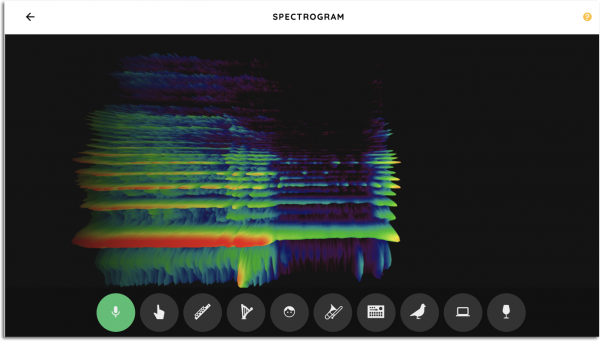 Spectrogram shows a visual picture of the frequencies that make up sound. Choose an instrument or sound source from the buttons at the bottom of the screen to compare spectrograms of different sounds. Ask students what loud sounds look like on the spectrogram? How about quiet sounds? If you have already used the Harmonics and Oscillators experiments with your students you could ask them whether they can see the fundamental and overtones in the spectrogram image. Which sound sources produce the most overtones? 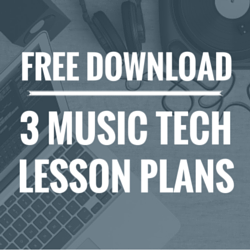 Display the Spectrogram on your data projector during vocal warm-ups in choir rehearsal. Click on the microphone and let the choir members see a visual representation of the exercises they are singing. A great way to keep everyone engaged! 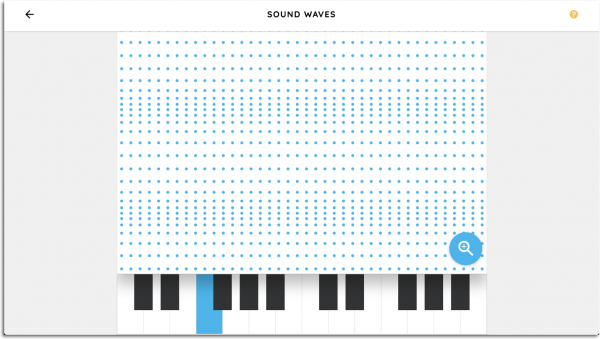 Play a note on the keyboard to see a visual representation of the way in which a sound wave travels through air molecules. 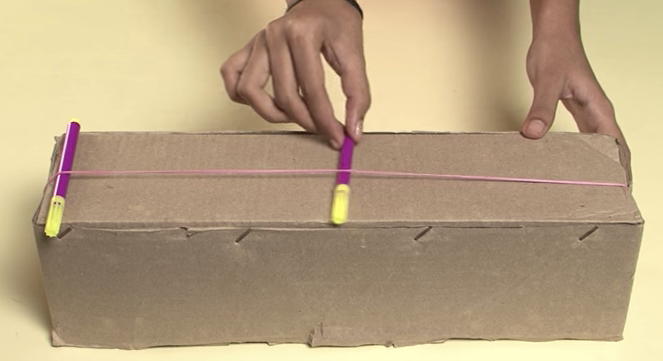 Play a low note and ask students to describe the way the air molecules move. Are they moving slow or fast? What happens when you play a high note? Are they moving faster or slower than the low note? Zoom in using the magnifying glass and play a low note. Describe the waveform of a low note. 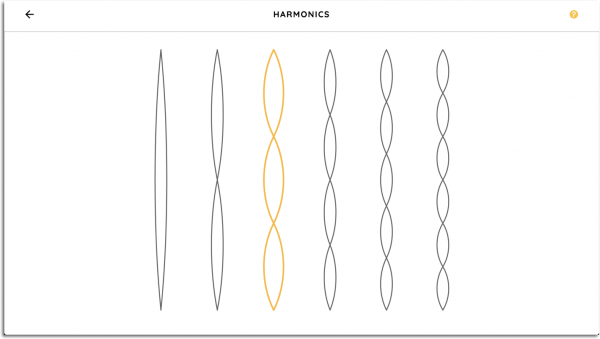 Play a high note and describe the waveform now – is it different to the low note? 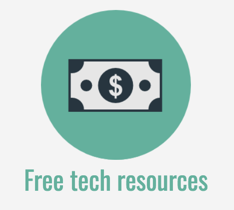 Open Oscillators on a separate tab or on another device and play a low frequency. How does the waveform in the oscillator character’s mouth compare to the sound wave produced by a low note in the Sound Waves experiment? 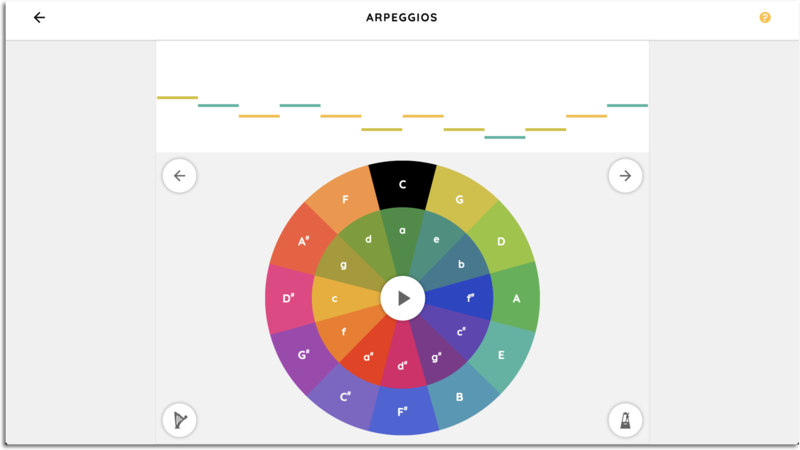 Click on a chord on the coloured wheel to play a single major or minor arpeggio. Press the play button to hear the selected chord play in the pattern shown at the top of the screen. The artist Wassily Kandinsky compared painting to making music. 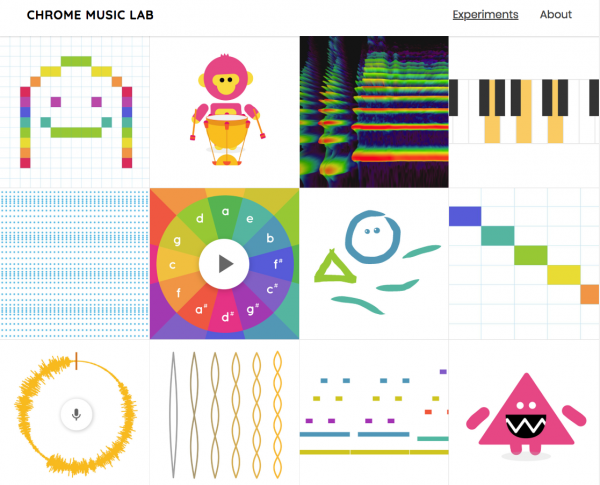 In this experiment you can draw shapes, lines and scribbles on the screen and hear them turn into sound. Different shapes make different types of sounds. Try circle and triangle! 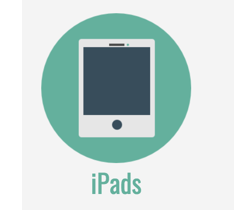 Young students can draw a picture on a piece of paper using 3 or 4 shapes/lines. 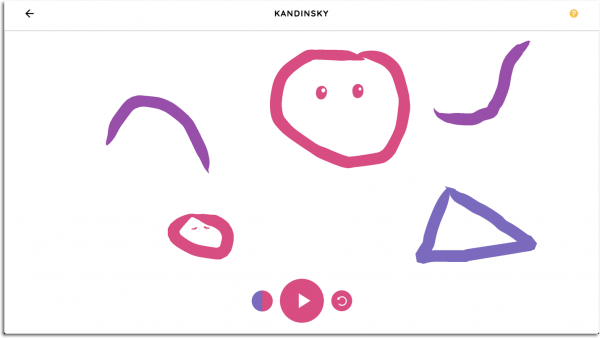 They can then recreate (copy) their picture in the Kandinsky experiment and press play to hear the drawing. 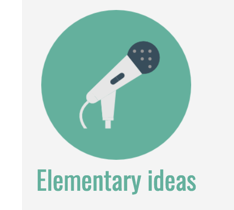 Ask the students: does your picture sound the way you expected? What do you like about the sound of your picture? Anything you would change? 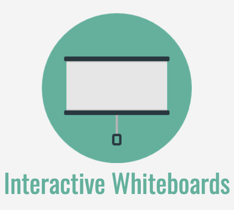 Draw a picture on the screen and play it back with the different sound/colour options – which one do you like the best? Why? 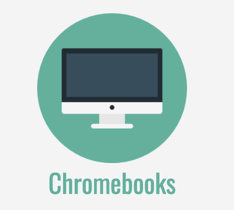 Draw some horizontal lines on the screen at different heights – what’s the difference between the lines drawn at the bottom of the screen and those drawn in the middle or the top of the screen? 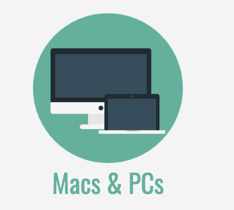 Draw a circle on the screen – what happens? Can you draw two more circles that make higher or lower sounds than your first circle? Cross-curricular opportunity: learn about Kandinsky the artist in this biography written especially for kids and/or create some art projects like these ones. 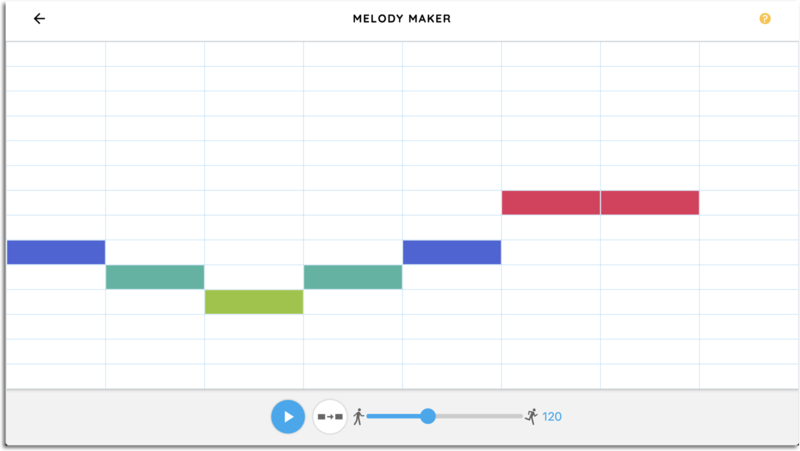 The Melody Maker allows students to create a single-line melody using graphic-style notation which represents time (from left to right) and pitch (up and down). Drag the slider left or right to hear the Voice Spinner recording played slow, fast, forward or backward. 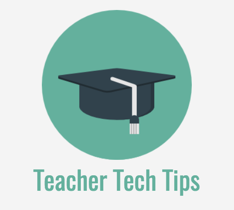 Ask students to note that as the slider is moved left or right the pitch changes. Where on the line is the pitch of the sound at its lowest? When you move the slider all the way to the right or all the way to the left, the spinner moves more quickly. What happens to the pitch of the sound when it moves more quickly? What about when it spins slowly? 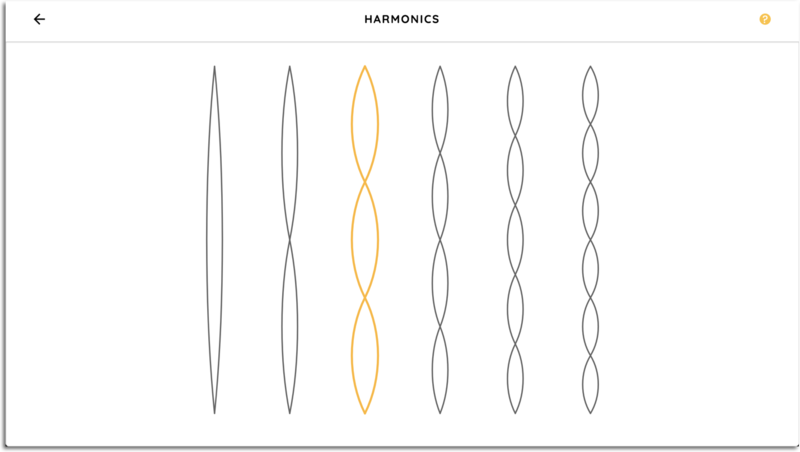 Harmonics shows you a set of frequencies consisting of a fundamental and the overtones related to it by an exact fraction – twice as fast, three times as fast, four times as fast and so on. Open the CML Spectrogram experiment in another tab (or on another device) and ask students if they can see the harmonic series in the spectrogram for the flute, the harp, the trombone and the wine glass. What differences do they notice between each one? 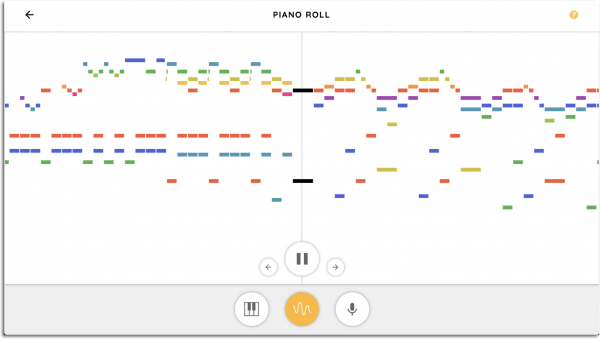 Inspired by the roll of paper you feed into a pianola, the Piano Roll experiment allows you to view a graphic notation version of a number of well-known pieces. 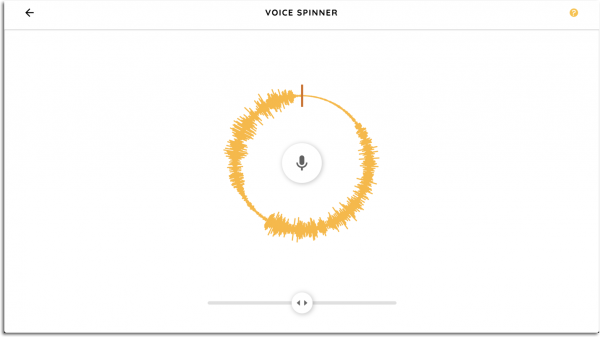 Record your own playback sound with the microphone. Short sounds work really well – try a cough, a single sung note, a clap or a dog bark! 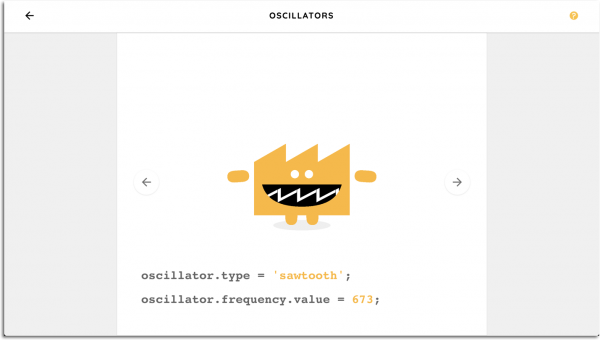 Click/tap and hold on the oscillator character on the screen to hear it “sing” a frequency. Drag your mouse/finger up or down to change the frequency value (and the shape of the character!). 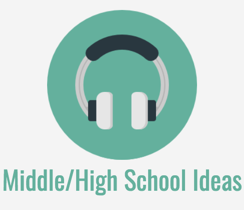 Ask students: does a small frequency value (number) produce a low sound or a high sound? Does a large frequency value (number) produce a low sound or a high sound? Ask students what they notice about the wave form that shows in the mouth of each oscillator: what does it look like when you play a high note? What does it look like when you play a low note? 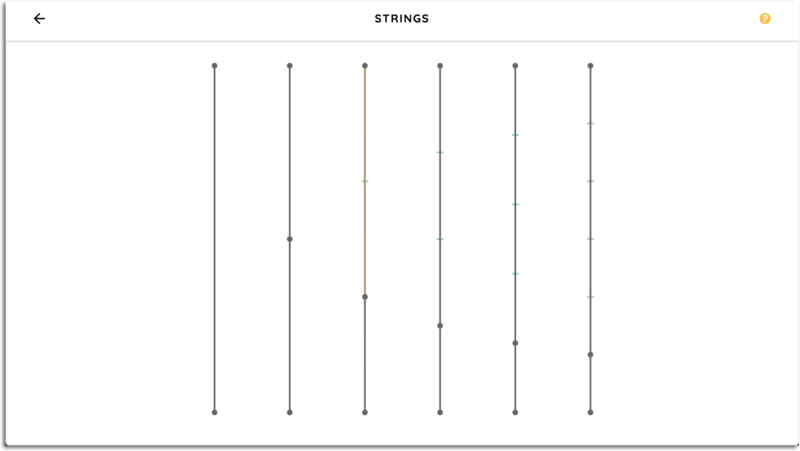 Click on a string to explore the mathematical relationship between the length of a string and its pitch.